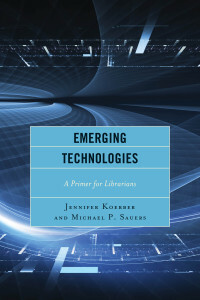 Emerging Technologies – a forthcoming book! Exciting news! This May, Michael Sauers and I have a book coming from Rowman & Littlefield. It’s based on our work talking about and training on emerging technologies in many fields, not just libraries. We had a lot of fun writing it, and even though it’s a textbook, we think you’ll enjoy reading it! If you order before Dec 31, 2015 and use the discount code on the flyer below, you’ll save 25% on the cover price. This entry was posted in Updates on March 17, 2015 by Jennifer Koerber.